For the purpose of rotating parts balancing in manufacturing scale, it is necessary to conduct measurements with the minimum possible participation of the operator. The Rotor balancing system is intended for measurements related to rotating parts balancing in automated mode. FFT Spectrum Analyzer (e.g., ZET 017-U2). 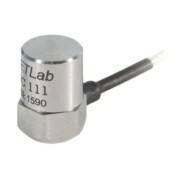 Accelerometer, stationary element to be balanced and RPM sensor are interconnected with each other by means of a platform with mounting fixtures. 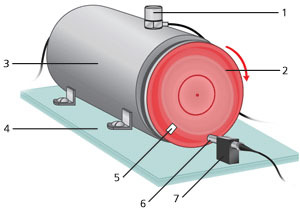 7 – mounting fixture for RPM sensor; the red arrow shows disk rotation direction (clockwise). Then the sensors are connected to the FFT Spectrum Analyzer. 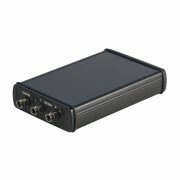 FFT Spectrum Analyzer is used for digital processing of the signals received from the sensors. 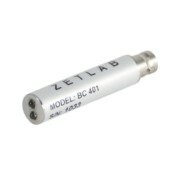 Evaluation of unbalancing parameters is performed by the programs from the scope of ZETLAB software package. The program “Electrical machine rotor balancing” allows to conduct measurements in automated mode and to produce test reports (the program is implemented in a graphical programming environment ZETVIEW). When this program is used, there is no need to make any additional filtration or signal processing. unbalance plane angle in relation to the light-reflecting mark. The angle of average unbalance is depicted in the program as “Unbalance angle”. The unbalance angle is calculated in degrees from the center of the light-reflecting mark to the opposite side of the balanced item rotation. The unbalance value is evaluated in standard measurement units gr×mm or gr×cm (depending on the requirements of a particular facility). The measurements results are saved into the log. A detailed user manual on installation of the sensors, signals processing and unbalance parameters evaluation is available in the article “Measurements of the unbalances”.